I am honored to be able to introduce you to Lori Wildenburg today. She is co-founder of an amazing parenting ministry and it is my joy to be able to share her words with you! Without any more delay, here is Lori. This is a portion of an email I received from a mom of two. This mom knows her daughter well. She is willing to learn a second language so she can demonstrate love to her child in the way the child best receives it. She desires to parent to her child’s uniqueness. God calls us, moms and dads, to train up our kids in the way they should go; to parent to their unique bent. So often we love in the way we need to be loved and parent the way we were parented. But like this mom, we are not stuck. We can learn another way. We can be a student of our child and raise him or her in a way that best suits his personality, temperament, age, and stage. Verbalizing affirmation can be like speaking a foreign language if your native love language is quality time, receiving gifts, acts of service, or physical touch. Here are three guidelines to keep in mind when articulating affirmation. * What is proclaimed is true. * The words spoken are sincere. * The phrases used are specific. We are all hard-wired to need affirmation. Some need it more than others. These messages can be delivered verbally, in written form, or via text. 101 Affirmations to Bless Your Child’s Heart. 3. I like the person you are becoming. 4. I love spending time with you. Would you like to come with me when I ____________? 5. I am so thankful God gave you to me! 6. I have noticed you are a good decision maker. You really thought ____________ through. 7. If I were your age, we would be friends for sure! 8. I appreciate your willingness to __________________________. 9. I love your sense of humor. 10. I thought about you when I saw___________________________. 11. I wish you were with me when ___________________________. 12. I missed you today when ________________________________. 13. I know God has great plans for you! 14. I appreciate the way you help me __________________________. 15. I have confidence in your ability to figure this out. 16. I appreciate your respectful attitude. 17. I can count on you. 18. I was just telling (grandparent) how proud I am of you. 19. I noticed how you asked _________ about his/her day. I am certain that made him/her feel good. 20. I love hearing about your day. 21. I look forward to seeing you walk through the door. 22. I love watching you and (sibling) play (hangout, spend time) together. 23. I see Jesus in you. 24. My heart sings when you hug me. 25. The best part of my day is spending time with you. 26. It makes me feel happy when you are with me. 27. This project is quality work. I am sure it feels good to give your best effort. 29. Thank you for doing________. You are responsible. 30. Thank you for helping me with______________. You are considerate. 31 Listening to you sing makes me so happy. 32. You make me smile. 33. You made God smile when you__________________ today. 34. You give the best hugs. 35. You are so brave. I noticed how you_____________. 36. You have a lot of patience. You really took your time with____________. 37. You are so thoughtful. Thanks for remembering ____________________. 38. Your laugh is contagious. 39. You make me laugh. 40. You are amazing. When I was your age I would never have been able to __________________. 41. You have a big heart. 42. You have a gentle soul. 45. Your life impacts others. 46. You did this all on your own. Wow! Impressive. 47. You are a blessing to me and to your (mom/dad). 48. You are so smart. How did you come up with that? 49. You really hung in there when the going got tough. You know how to persevere. 51. You are truthful and kind. What a great combination. 52. You are patient. You demonstrated patience when you_______________. 53. You showed humility. You made _________ feel special. 54. You are courageous. You exhibited courage when you _______________. 58. You are a good friend. 59. You showed compassion when__________________________________. 60. You have a good mind. You used it well when______________________. 61. You showed respect for authority when ___________________________. 62. You have leadership skills. You know your own mind. 63. Thanks for suggesting that. ___________ was a great idea. 64. Your good manners make being with you a joy. 65. Even when it’s hard, you are respectful. 66. You managed your frustration well when you______________________. 67. You exercised self-control when ________________________________. 68. You are so gentle with (pet, younger sibling). 69. You were unselfish when ______________________________________. 70. You are valuable (Luke 12:24). 72. You are a fellow citizen with the saints (Ephesian 2:19). 73. You can move mountains (Mark 11:22-23). 74. God created you for a special purpose. 75. God has gifted you with the talent of_____________________________. 76. God has equipped you to ______________________________________. 77. When you stood up for what was right, God was cheering you on! 78. You showed maturity when you _________________________________. 79. You are a child of the King! 81. You have a great sense of humor. 82. It’s so great you don’t take things too seriously. 83. Your (brother, sister, grandparent) thinks you are special. 84. You are a good listener. 87. You are God’s gift to Christ (John 17:24). 88. You are cherished (Ephesian 3:29). 89. God chose you (1 Peter 2:9). 90. God delights in you (Zephaniah 3:17). 91. God says you were created in Christ for good works (Ephesian 2:10). 92. God sings over you (Zephaniah 3:17). 93. God is with you (Zephaniah 3:17). 94. God rejoices over you (Zephaniah 3:17). 95. God will guard you (2 Timothy 1:12). 96. God will guide you (Psalm 48:14). 97. God will help you (Isaiah 44:2). 98. God equips you (2 Timothy 3:16-17). 99. God created you in His image (Genesis 1:27). 100. God will never leave you (Hebrews 13:5). 101. God loves you (John 3:16). Affirmations are declarations of the truth. They may be related to a relationship, a skill set, an observable character trait, or a promise of God. Kids need affirmation, encouragement and attention from their parents. With the busyness of fall moving in let’s not only meet the needs for provision and education but also be intentional regarding spending quality time together, expressing appreciation for who our kids are and the things they do, and…affection (depending on the child it may look like a big ol’ bear hug or shoulder rub). What could you add to the affirmation list? If this post has been a blessing to your heart you will want to read Raising Little Kids with Big Love (toddler 9 years of age) and Raising Big Kids with Supernatural Love (tween young adult). 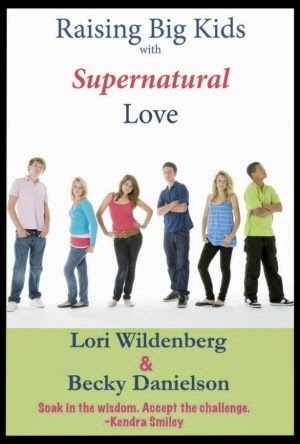 Lori Wildenberg is a mom of 4 and co-founder of 1 Corinthians 13 Parenting. She is passionate about speaking to and working with parents to help them be the parents their children need. She’s a licensed family- parent educator and certified teacher. She has co-authored 3 parenting books including Raising Little Kids with Big Love. This book is a favorite resource for moms of young children. It’s practical and easy to apply. The book addresses whining, tantrums, time-outs, self-worth, sibling rivalry, parenting styles and more. A perfect day in Lori’s world is a hike with her hubby, four kids, and Murphy the family labradoodle.